The Raspberry Pi has got its very own official keyboard and mouse, and they're available to buy now. 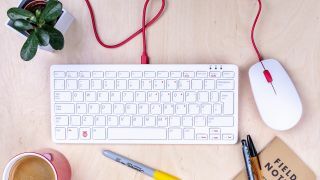 Produced by the Raspberry Pi Foundation, the keyboard – which retails at £15.60 or $17 – is available in white with red trim, or black and grey, and in UK and US models, as well as French, German, Italian and Spanish. The keyboard is compact at 284 x 121mm and has 79 keys (78 on the US model), plus it comes with a built-in USB hub. In terms of connectivity, you get a micro-USB port to connect to the Raspberry Pi, and three USB Type-A ports. You can then plug your official Raspberry Pi mouse into one of those USB ports. The mouse itself is available in the same colors as the keyboard – white and red, or black and grey – and has a price tag of £7.30 or $8. The optical mouse has two main buttons along with a scroll wheel which, when pressed down, serves as a third button, and benefits from high-quality Omron switches. It's been ergonomically designed, with a weight and feel that aims to make the peripheral pleasant to use. You can also buy the keyboard and mouse together in a bundle for £22 or $25, a slight saving of almost a pound in the UK – oddly, Americans don’t get any money off for buying the peripherals together. Other interesting Pi accessories we’ve seen recently include an affordable Raspberry Pi case that comes with a built-in touchscreen.